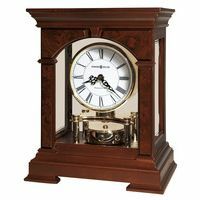 Contemporary designer Kieninger mantel clock with three dimensional solid wooden frame features striking white piano finish. 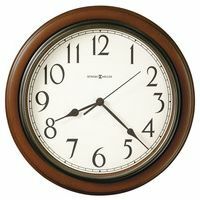 This clock has an impressive technical mechanism. The visible Tourbillon escapement also acts as a seconds indication, and the clock chimes one of three chosen melodies every quarter hour. 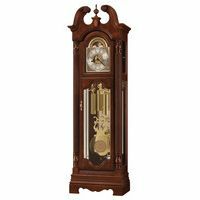 This clock is a beautiful presentation piece with true heirloom quality. The glass panels allow a full view of the caliber J0256 movement and consist of an extravagant chrome plated brass frame construction. A silver plated brass dial with etched decor and an exclusive tourbillon escapement serving as second indication complete this unique clock design. JE Kieninger movement with 1/4 key wind movement with front mounted tourbillon (Swiss style escapement, 11 jewels with screw balance), pinned chime drum with triple chime (Westminster, St. Michael and Whittington) on 8-rod gong, run time 7 days, plate size 100 x 104 x 2,0 mm, 10 ball bearings and 4 bronce bushings (Aeterna), removable spring barrels, anti-snap-back winding, front winding, chime shut-off and permanent night time shut-off between 10.00 PM and 7.15 AM. Movement caliber used exclusively in Kieninger clocks. Limited edition.